Recycling The Rafu is so IN! And it was in before anyone realized that. This has been the running joke around The Rafu Shimpo office for as long I can recall. The newspaper stays essentially the same with no transformation into another product. Through the early ’80s, as Japanese families congregated in specific areas of Los Angeles, bike riding delivery boys threw The Rafu in their yards. Lady Luck was with anyone whose paper actually landed on their doorstep. Many eyes within one household would read the daily paper. Funny how each issue was quite likely to have feet—it would go beyond one family reading that same issue. Even to this day, stories are told about The Rafu being recycled with friends, neighbors and “the kids” whenever they visit or need a babysitter. One subscriber living in Monterey Park could trace one paper touching 14 households. Self-taught artist Andrea Jyunko Marjala of Auberry provided an interesting tidbit about how The Rafu made its rounds in Utah during the mid-’50s. Marjala’s mom, Connie Nomura, recalls as a little girl growing in Ogden that her parents, Frank and Frances Nomura, would take their Rafu to the Buddhist church, where everyone would pass it around to read. When papers were eventually returned to them, the next stop was the Christian church for reuse. “Every time they came back, they were worn and tattered because so many people had read them,” said Connie. She recalls the excitement and anticipation from everyone to catch up with the news. With an artistic bent, Marjala first received a business administration education coupled with art electives. In the mid-’90s, she became mesmerized with an ancient Japanese technique after reading a book about Buddhist Priest Rokoan Gido (1761-1834). 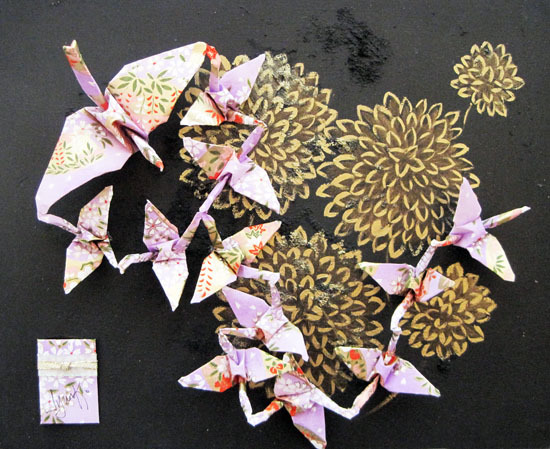 Think hand-folding multiple cranes from a single sheet of paper, all connected by the head, tail and/or wing. This is what Priest Gido created — the Rokoan Tsunagiori style of origami. Her goal was to master this craft. That she did. 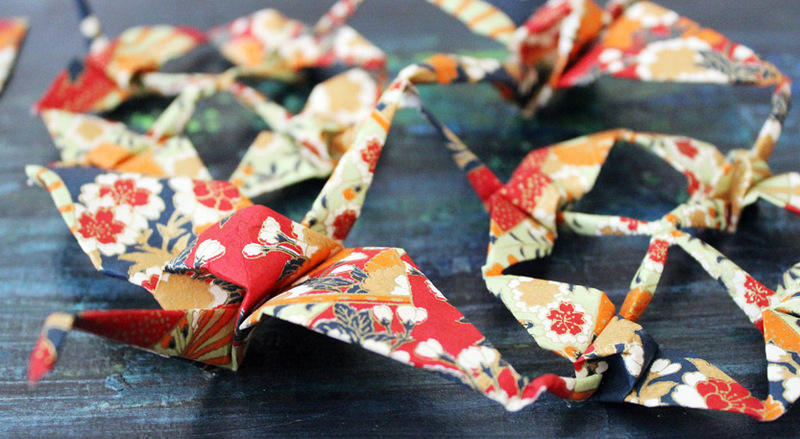 Folding one perfect tsuru so that the white underside of the paper is invisible is not an easy task! Raise your hand if you’re one of many, me included, who have helped fold 1,001 paper cranes to celebrate love and good fortune for a family member or friend. Did you ace it? Following the birth of her fourth son in 2003, Marjala’s origami art business took off, and it now keeps her busy as a stay-at-home mom. A Fresno State Fair top prize winner was “Butterfly in Flight,” and it continues to be a top seller. See her artwork along with 47 artisans from near and far at the 14th annual United Japanese Christian Church’s Asian Craft and Food Faire this Saturday in Clovis. Expect ideal weather this weekend for fun shopping and good eats! Check out Krafty Korner online in living color at www.rafu.com! Saturday, Sept. 15, 10 a.m.- 4 p.m.
Saturday, Sept. 22, 9 a.m.-3 p.m.
Saturday, Sept. 29, 9 a.m.-3 p.m.
Sunday, Sept. 30, 10 a.m.-4 p.m.
Saturday, Oct. 6, 9 a.m.-4 p.m.
Saturday, Oct. 13, 8 a.m.-2:30 p.m.
Saturday, Oct. 20, 9 a.m.-5 p.m.
Sunday, Oct. 21, 9:30 a.m.-3 p.m.
Sunday, Oct. 28, 10 a.m.-4 p.m.
Saturday-Sunday, Nov. 9-11, 10 a.m.-5 p.m.
Sunday, Nov. 4, 10 a.m.-3 p.m.
Saturday, Nov. 10, 10 a.m.-4 p.m.
Saturday, Nov. 17, 10 a.m.-4 p.m.
Saturday, Nov. 17, 10 a.m.-3 p.m.
Sunday, Nov. 18, 9 a.m.-3 p.m.
Sunday, Dec. 1, 4-7 p.m.
Sunday, Dec. 2, 10 a.m.-4 p.m.
Sunday, Dec. 2, 11 a.m.-2 p.m.
Sunday, Dec. 9, 10 a.m.-3:30 p.m.
Saturday, Dec. 15, 10 a.m.-4 p.m.